On this page the full results of the CWTS Leiden Ranking can be downloaded in an Excel file. 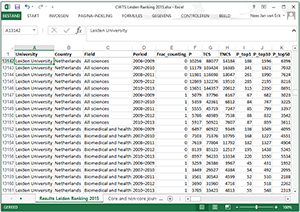 The results of the CWTS Leiden Ranking 2018 are available for download in an Excel file. The file can be used to analyze the results of the Leiden Ranking in more detail. For each combination of a university, a main field, and a time period, the Excel file provides the values of all indicators. In the case of the size-independent indicators, stability intervals are also provided. Download results of the CWTS Leiden Ranking 2018. The results of previous editions of the CWTS Leiden Ranking are also available for download.